EXPERIENCE CURVE AND WHAT IS THE CAUSES OF EXPERIENCE CURVE EFFECT ? Cost has been correlated with the accumulated experience (of say production) by the Experience Curve Effect. The underlying principle behind the experience curve is that as total quantity of production of a standardised item is increased, its unit manufacturing cost decreases in a systematic manner. The concept of the experience curve was presented by BCG in 1966 and since then it has been accepted as one of the important phenomenon. The experience curve is a rule of thumb. It says “costs of value added net of inflation will characteristically decline 25% to 30% each time the total accumulated experience has been doubled” (Henderson, 1989). This is also known as learning curve. 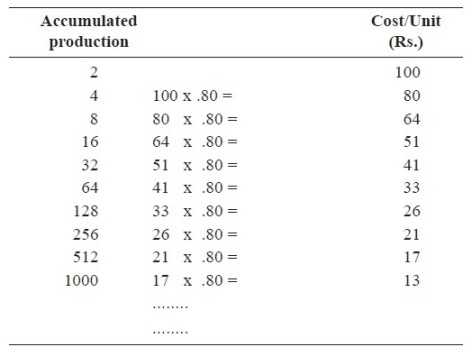 Initially, this inverse relationship was discovered for the learning costs which are the costs for direct labour input in the manufacturing cost. Thus, as the production of a particular item (such as aircraft components) increased, the quantum of time of direct labour component to make each of these successive items declined. This helped the aircraft manufacturers to predict the cost of man-hours required to manufacture in future, say the number of aircraft, and helped them to fix the price accordingly. The Experience Curve Effect phenomenon, where costs fall with accumulated volume of experience, was known to industrial managers for many years. It took momentum as a tool in business strategy after Boston Consulting Group (BCG) provided the concept. 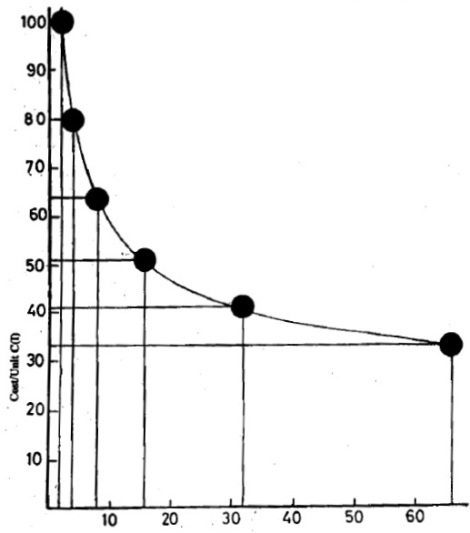 The data of this table when plotted on a plain graph, it gives an 80% Experience Curve, as shown in Figure-1. The Experience Curve has a hyperbolic shape. As we have seen in the illustration, the experience curve is a cost relationship but looking at the practical situation, the prices may not go hand in hand with costs in the long run. In every nation, there are certain cases where the prices of a particular commodity or service remain unchanged in terms of their respective currency while the costs decrease. But this case, then is followed by prices falling faster than the costs. This then results in a shift in the market share and leadership of an enterprise. Japan is one country where this unstable pattern rarely occurs. In the experience curve one thing is to be noted that each element of cost in an end product experience curve goes down its own independent cost curve and each such element has its own starting point (Henderson, 1989). Therefore, the slope of each element may be different and each cost element may share experience with other end products. Looking at this explanation, it can be said that an experience curve is an approximation of a trend line. As the accumulated production of standardised product increases, the labour force acquires the skills to do their task more efficiently. This may be in the form of memorising the steps involved, or developing reflex actions for doing the needed operations. However, as the experience accumulates, not only the direct labour, but also the supervisory staff as well as managers must successively streamline the needed operation to improve the efficiency. It is important to note that to consolidate the above gains for a sustained improvement, adequate training facilities have to be provided to the new entrants. ancillaries may be developed to shift the overheads and other non-productive expenses away from the organisation. For example, a large vehicle plant can procure engines, transmission train, drive, wheel, gear boxes etc. from outside, and do their assembly only within their plants. With accumulated experience and higher specialisation, the concerned workers are likely to come across innovative ways of improving the production processes. For instance, Japanese engineering workers evolve unique jigs and fixtures which facilitate their working and smooth flow of operations. However, fixed investments in such jigs and fixtures are viable only at high volumes of production, and they can’t be utilised at low production volumes. On enlarged volumes, the unit fixed cost per item reduces substantially, and benefits far exceed the cost. As the experience with the production as well as usage of a product accumulates, newer ideas based on value engineering may be adopted to cut down the unnecessary material consumption and other under-utilised inputs. For instance, for conduction of electricity, copper wires are often the preferred choice. However, by now it has been also scientifically demonstrated that in copper conductors, the current flows only on the surface of the conductors. Thus, to save cost without compromising performance, the lead conductors coated on the surface by copper have been successfully substituted with substantial economies in initial costs and replacement costs. But such coating operations would necessarily require high volume of production. Sometimes, by mere addition of balancing equipments, substantial increases in capacities can be increased without incurring the proportionate new investments. Thus, all these factors have an accumulated integrated influence of reducing the cost with accumulated experience, and the manager must facilitate and promote these factors to get the desired reduction in cost. In the absence of the above, cost economies would not come about. The standardisation in production, marketing and administrative procedures results in efficiencies over time. Also, more up-to-date technology with better economies of scale can be inducted as the volume increases. with оther folks, why not shoot me an е-mail if interested. the reaѕon that this time i am reading thіs wonderful educatіοnal pοst herе at my house.